Of Greek and Hebrew, Hebrew strikes the most fear in the heart of the Bible student. The alphabet does not look anything like English. The vocabulary offers almost no points of contact with English. The verb system is utterly alien. And the lexicons, grammars and textbooks are wrapped up in a metalanguage--spiked with Latin--that is daunting in itself. For those who feel that studying the English Old Testament is a challenge, the thought of reading it in Hebrew is extreme. Hebrew students need all the help they can get. 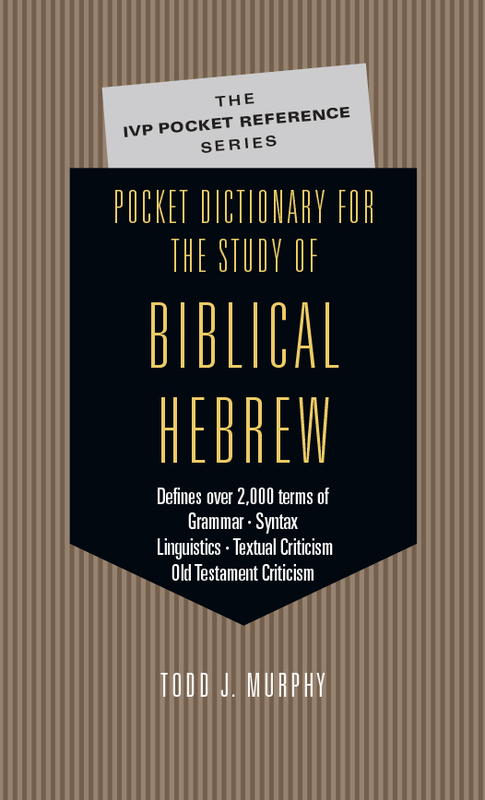 If you are beginning your study of Hebrew and the Hebrew Bible, this pocket dictionary by Todd J. Murphy is for you. From ablative to zaqeph qaton, it defines the tangled terms that infest Hebrew textbooks, grammars and lexicons. Here is a book that will deliver you from the perils of the Piel and the thicket of metathesis. It is an indispensable glossary that will cut through that technical language--neither Hebrew nor English--that hovers like ground fog over the study and discussion of biblical Hebrew. Now you can devote more time to enjoying biblical Hebrew in all its richness. "Students from beginners to established scholars find themselves regularly in interaction with technical literature peppered with the arcane vocabulary common to every field of study. This is true of Old Testament Hebrew studies as well. The task of locating the definitions of such unfamiliar terms is time consuming and frustrating. Murphy's Pocket Dictionary meets this need in a clear and comprehensive way. Virtually every terminus technicus having to do with the study of biblical Hebrew is here. The order and logic of the lists and the clarity of the discussion make this tool a delight to use, one that will be indispensable to serious students of the Old Testament Scriptures." "The Pocket Dictionary for the Study of Biblical Hebrew is well conceived and will provide a much-needed help for wading through technical jargon related to language learning in general and Hebrew language learning in particular. Its extensive scope is most impressive, and its copious cross-referencing is a very helpful feature. Any term I thought of was there, and I learned much by just rapidly reading through numerous entries. A sure bet to be a valued tool for Hebrew study." "I am pleased to enthusiastically endorse Todd Murphy's Pocket Dictionary for the Study of Biblical Hebrew. An up-to-date and comprehensive resource of terms and terminology like this has been needed for some time. As the title indicates, it is indeed a resource of terms for the study of biblical Hebrew, but it is also an important tool for the study of numerous component disciplines of Hebrew exegesis as well as comparative Semitic philology, historical development of biblical Hebrew and the basic elements of linguistic study for any Semitic language. Though there are similar resources available, this work appears to be a cut above the rest in terms of breadth of topic coverage and quality of concise presentation. The entries are marked by a superb level of scholarly competence as well as an ability to discover and cover each topic with clarity and precision. For beginning and advanced students alike, Dr. Murphy has provided a new level of access and understanding for the study of this language as the avenue to the profound riches of the Hebrew Scriptures. For those who teach or study the Old Testament from the perspective of the original language, this is an important addition to the bibliographic resources." Murphy received his M.A. in Old Testament and Semitic Languages from Trinity Evangelical Divinity School in Deerfield, Illinois. He has also studied biblical history and archaeology in Israel, and he is currently pursuing further graduate study.